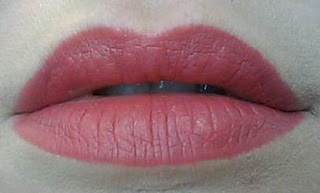 Smokin' Hot Pink is a very interesting shade, and quite frankly, it looks boring in the tube. 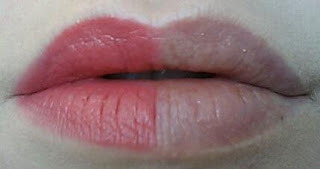 However, a light application (pat it gently on the lip) gives that shade of flushed pink that one might get after a good smooching. 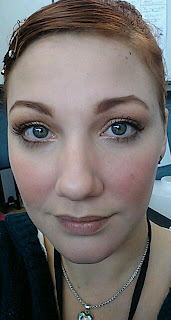 A heavier application slowly builds to a raspberry (purple-red) pink. This is a cool pink, and it doesn't pull yellow or orange tones on me. I think it looks garish on me when I wear it full strength, but I like how it looks after blotting with a tissue. Now, a thin layer, applied with a lip brush. I'm sure you can tell, but yes, I left half of my lips bare for comparison. Notice that, aside from my light dimming in the second photo so there is less shine, you can't really tell a difference between the two. This color goes on opaque very quickly. Next is full lip. I applied directly from the tube to the bare side, and it only needed one coat. I cleaned up the lip line with my lip brush. Because this color is so pigmented, I recommend treating it like you would a red lipstick application, and take care to not let it get sloppy. If you look closely, you can see where I lost a bit of control on my lower lip. Is it obvious in person? No. But photos are pretty easy to criticize, so keep that in mind if you think you'll be photographed while wearing this.